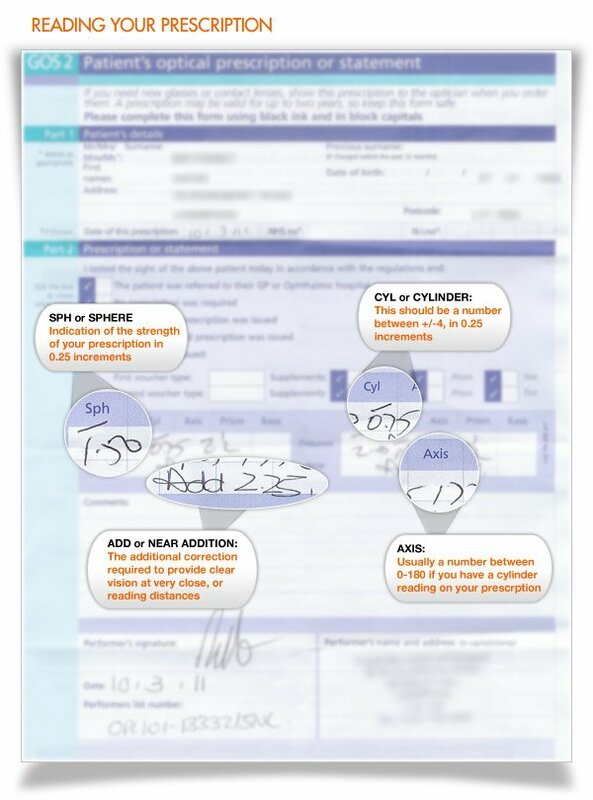 Before you place an order with SpeckyFourEyes.com, you must ensure that you have a copy of your prescription that was given to you at your last eye examination. If your prescription is less than 2 years old you can go ahead and place an order with us. If however it is over two years old we advise that you go to your usual local or high street optician and obtain a new prescription. By law, your Optician must provide you with a clear, legible copy of your prescription after an eye test, and you should not be subjected to any pressure to buy from them. CYL or CYLINDER: component is the fine tuning, means you have astigmatism i.e. your eyeball is a rugby ball shape rather than a perfect sphere. Sometimes there will be a "DS" entered in this box. This simply means there are no values present for the CYL or AXIS. When there is no prescription present there are a variety of ways this can be written. 0.00/pl/plano/infinity/number 8 on its side. To ensure you do not make any mistakes when entering your prescription please make sure that you do not confuse (+) and (-) values. If you are in anyway unsure of your prescription details and how to enter the details simply call us on 03448 20 20 20 and you can speak to our optician or alternatively email or fax (01274 59 59 29) us a copy of your prescription and we will be able to assist you. If there is any information written on your prescription that you are unable to enter on our prescription form simply enter the details in the "EXTRA INFORMATION" box. We do not require the V/A numbers written down (eg. 6/6) as these numbers are not required when making up your glasses. Please note that if your prescription has PRISM values written there is an additional charge of £15 for this as we are required to use a more specialised lens.